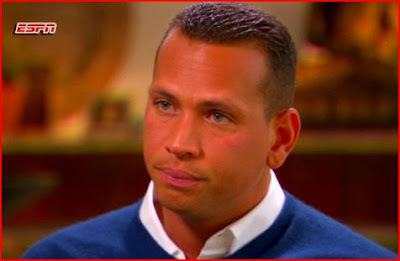 If you have not watched the near-36-minute interview of A-Rod by Peter Gammons, I highly recommend you watch it so you can see for yourself if he is being honest or not. Before watching the interview, I was glad that A-Rod admitted taking steroids. Like I said in my previous post about A-Rod, I wish we could figure out the time span of his use of performance enhancing drugs (PEDs). Still without seeing the interview, I heard that A-Rod admitted to taking steroids just from 2001-2003. My reaction: OK, at least his Yankee years are clean. But still, his season high in home runs came in 2002 when he hit 57 and he won his first MVP in 2003. Finally after watching the entire interview, I have changed my opinion on A-Rod completely. I believe I have caught him a few times lying about important specific information. Throughout the interview, he reiterated that during his time in Texas, there was a different "culture" than there is today (referring to the higher prevalence of PEDs). He also used the cliche, "the truth will always set you free" numerous times (hoping to gain some credibility from his fans). You might be right A-Rod, but in order for the truth to set you free, you have to actually tell the truth. "You have nutritionists, doctors, and trainers," A-Rod said. "I'm not sure exactly which substance I used, but whatever it is, I feel terribly about it." Later he said, "to be honest I don't know exactly what substance I was guilty of using." WHAT! You just lost all of your credibility right there A-Rod. If you are going to admit to all of the PEDs you have ever taken in a formal interview, how in the world do you not know exactly what you took? Notice in the last part of the quote, he says "substance I was guilty of using." What other substances are there A-Rod? When you are admitting that you took PEDs, you have to mention everything that you have taken. If you don't, you are lying because you have not told us everything there is to know. If you listen to his entire answer, he wraps up by saying, "did I hear jokes about A-Rod? Yea, we joked about a lot of things - 25 guys had 25 different nicknames." A contradiction to say the least. I don't know if I'm making something out of nothing here, but this affects his credibility a great deal for me. I'm talking about his very first instinct, to say the word "never." Torre said coach Larry Bowa used to invoke A-Fraud when hitting grounders after the ex-Mariner had a bad night in the field. "He says, 'Come on, let's see who we see today? Is it going to be A-Rod or A-Fraud? Let's go,' " Torre recalled. "I mean, it was in front of him. You never did any of that stuff behind his back." I'm sorry A-Rod, but Joe Torre represents the pinnacle of honesty. What Torre has said here is no different from the norm. On a second look through on A-Rod's interview with Gammons, I noticed when asked if "the time period was 2001,'02 and '03," A-Rod replied with, "that's pretty accurate, yes." ...What kind of an answer is that?! Are other reporters missing this? According to A-Rod, the time period for his steroid use (2001-2003) is pretty accurate. It's a yes or no question! My tip for A-Rod: don't lie about other things when you are in the middle of admitting for the first time that you did in fact use PEDs. Is there anyone out there who still believes A-Rod? You and I sae the same interview. All I was doing while watching was saying "Huh?" The only point I give hinm is that he admitting using, But almost everything else I just do not buy. It was amazing to me how I've always defended A-Rod in the past when he has been criticized for not performing under the clutch. But after listening to him in this interview, I've totally switched sides - and I don't see myself switching back again either.